the star that showed our way the prior night. and all the sneezes caused by frankincense. and make us hope that peace will still the sword. just as softly as a pachyderm is able. A Christmas poem for Kerry O’Connor’s mixed-up titles prompt on With Real Toads. The above picture is a collaboration of Giotto and MDD (me!) 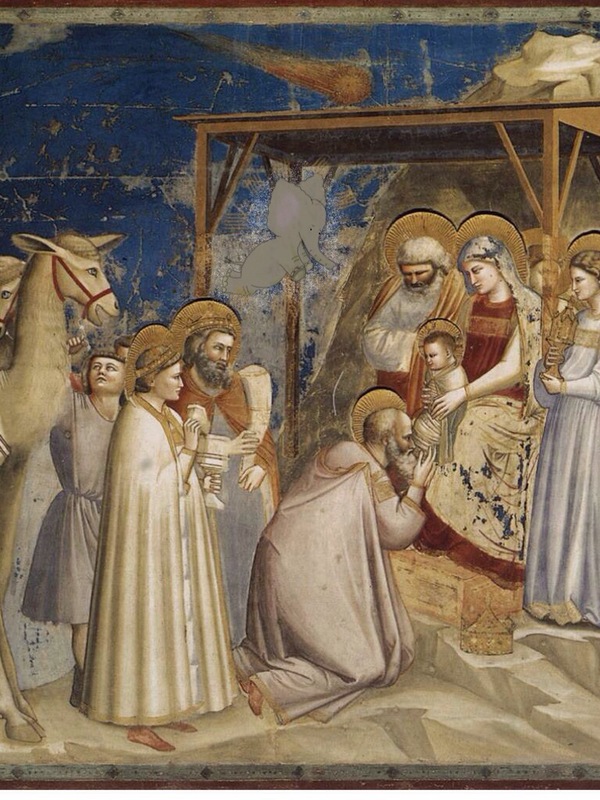 (The Adoration of the Magi). This entry was posted on December 21, 2014 at 6:53 am and is filed under elephants, iPad art, poetry. You can subscribe via RSS 2.0 feed to this post's comments. And whose to say there was not an elephant on that journey? I loved your Christmas tale with your signature twist on the theme. Thanks, Kerry. A merry christmas to you! k.
Loved this…. it needs to be a kid’s book with wonderful illustrations. What a wonderful spin of the tale… Elephants have been to much ignored.. and I guess that if there were flying elephants it would be a true wonder… I smiled all the way through. Have a marvelous Holiday Karin. This is such a charming retelling from an endearing perspective. Love it 🙂 And what a cute artistic addition to the Giotto! !